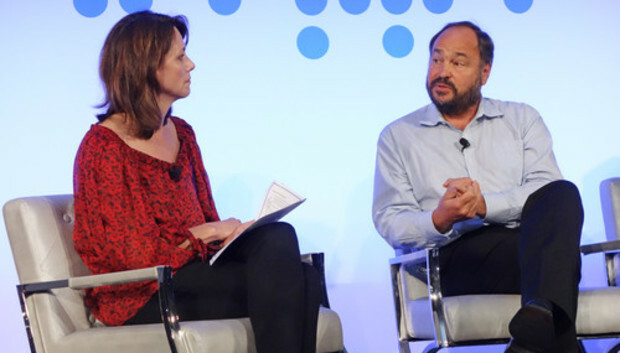 The cutting edge of innovation in using data has shifted from the financial services sector to the consumer realm, and it's about to move again to the industrial sector, said Paul Maritz, CEO of Pivotal. "It's the industrial space that really has to take the usage of data to a whole new level," Maritz said. Pivotal, a PaaS (platform as a service) company formed by VMware and EMC with an investment by GE, will develop cloud-agnostic industrial offerings in conjunction with GE. Also on Tuesday, GE announced an expanded relationship with Accenture to develop technology and analytics applications, plus a partnership with Amazon Web Services, which will be able to host GE's services. Industrial equipment around the world, including jet engines, gas turbines and other products GE makes, can generate huge amounts of data that could be used to boost efficiency and prevent unexpected failures, said Bill Ruh, vice president of GE's Global Software Center. That data will grow at twice the rate of other types of information in the coming years, according to a study by research company Wikibon that was sponsored by GE. Transportation, manufacturing, health care and other sectors could benefit, GE says. GE's new platform is designed to help enterprises collect and use data from many types of GE equipment, either on their own private clouds or on Amazon Web Services. As part of that platform, GE introduced Proficy Historian HD, a software tool for learning from real-time and historical data to improve industrial operations. The company built that software using the Hadoop distributed computing system because of its scalability. "How do I understand if the equipment is telling me that a problem is minor today that's going to be major tomorrow?" Courtney said. Devon Energy, an oil and gas company in Oklahoma City, is interested in making better use of its data from gas and oil fields. Devon believes better tools for collecting, analyzing and using data could help to make its wells and its exploration work more efficient, said Catherine Oster, supervisor of reservoir engineering at Devon's E&P Strategic Services division, who attended the event. Devon is starting to talk with GE about some projects, including generators for use at remote gas wells. Devon's exploration and drilling work generates many types of data, including 3D seismic maps, SCADA information from meters on wells, and the results of tests on cores extracted from each field, Oster said. If all that data could be combined, the company might learn more about the best places to drill and how to get the most out of the wells it's already operating, she said. For example, more optimal drilling could mean fewer wells and lower costs. Yet there are numerous challenges involved, including managing each type of data so it's accessible and governed correctly, Oster said. The quality of the data alone can be a problem, as human-entry errors or breaks in wireless connections can leave holes or incorrect entries in a set of data. Among other things, putting data in the cloud might help to solve the accessibility problem, she said. GE sees massive potential in the industrial Internet, forecasting US$514 billion of industry investment and $1.3 trillion of value created by 2020, citing the Wikibon report. "Delivering better advertising certainly delivers significant value, but ultimately it's the industrial Internet applications that I think have the potential to really change societal outcomes," Kelly said. GE's Ruh warned the industrial Internet is still in its infancy and more work is needed. "This is an incredibly big and complicated effort," he said. Security, compliance and overcoming the inertia of conservative industries are all on the agenda. One goal will be interoperability and data-sharing among many different platforms like GE's, he said. "What made the Internet successful is a few simple protocols. ... I think that's what's going to be key here, that we figure out where the standards have to occur," Ruh said. « Is it me, or are the walls melting in this 3D printed room?